Perfect for the morning commute or anytime on the road. Add your favorite photos to our travel mugs. Fill an extra-large latte mug with everything you love. From favorite faces to wise words to playful patterns, makes the perfect gift! 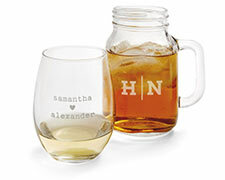 Create a heartfelt gift or charming addition to the table with personalized wine glasses and mason jars. 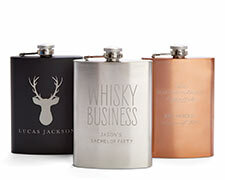 Personalize an engraved flask with a monogram or special message. Makes the perfect gift or memorable keepsake. Make an elegant gift for the wine lover in your life or bring your own unique style to the table at your next event with personalized stemless wine glasses. Make a charming gift for one or create a fun, casual nostalgic feel for any event by adding personalized mason jars to the table. 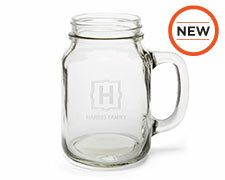 If you’re looking for a unique gift or new ways to spruce up your family dinner table, custom drinkware from Shutterfly fits the bill. From everyday cups and mugs to beautiful hand-blown glass pilsners and liquor decanters, there’s no shortage of inspiration at your fingertips. Drink up, say cheers and proudly showcase your personalized drinkware. There’s nothing more satisfying than a good cup of coffee, whether it’s at home, on the road or from the office pot at work. 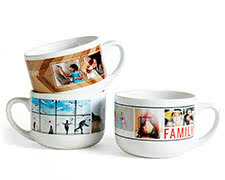 Our customizable photo mugs are perfect for a much-needed pick-me-up, as well as making a stylish statement. Make your colleagues envious by bringing a coffee mug that you designed and created or give a gift they’ll be sure to remember and use every day. 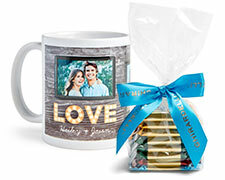 Choose from a variety of colors, sizes, themes, and a number of photos for the most artistic ceramic mug possible. If you decide to give this as a gift for the holidays or a birthday, you can choose from additional gift options, such as delicious Ghirardelli chocolates, premium hot cocoa, peppermint bars and more. Do you travel a lot? Do you find yourself stuck in traffic most mornings? 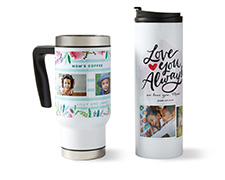 Brighten your day and make the commute easier with a personalized stainless steel travel mug. Keep your coffee, tea or hot beverage warm with a mug that illustrates important and beloved life moments. Rather than staring at the license plate in front of you during bumper-to-bumper traffic, simply look down at your memories on the go for a reminder of home. 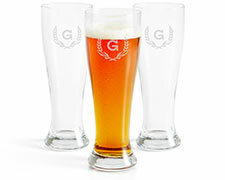 One of the greatest and most appreciated gifts for wine, beer, and liquor lovers is personalized drinkware. Rather than giving a wine bottle as a housewarming gift or a six-pack for a birthday, give a gift that’ll last a lifetime. 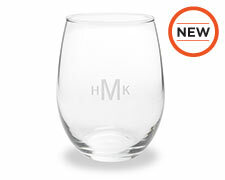 Personalized stemless wine glasses bring elegance and sophistication to any home. Perfect for entertaining guests or simply enjoying a fine wine during a private family dinner, our wine glasses make a unique and stylish statement to those around you and/or your recipient. Choose between dates, monograms, names or come up with your creative statements for wine glasses that’ll radiate class, beauty, and style. For something a bit more rustic, look no further than our stainless steel flasks. Flasks are not only iconic and quintessential for any liquor lover, but are a gift that keeps on giving. Whether you’re searching for a gift for Father’s Day or for a friend who loves to travel, flasks have been around for decades and have remained a common gift for a good reason. As a beautiful relic of the ages, flasks continue to grow in popularity for folks who appreciate fine liquor and sharing with like-minded individuals. Looking for a gift for the kids? 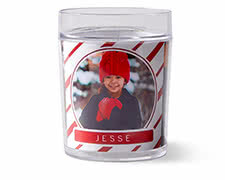 We offer cups that can be customized to feature photos of your little ones or a creative design made by you. More importantly, they’re BPA-free and dishwasher safe for longevity. Need a water bottle for workouts? 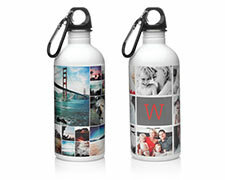 Keep hydrated with our photo water bottles and never be without your memories again.